Breast Cancer Awareness month is coming to a close. 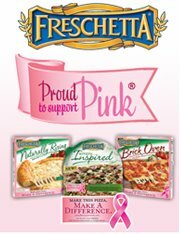 I’m happy that I got to participate in the FRESCHETTA Proud to Support Pink Campaign. There is still time for you to purchase some FRESCHETTA Proud to Support Pink Products, enter the product codes in the website and be a part of helping them reach their goal of donating $50,000 to the Memorial Sloan-Kettering Cancer Center. The winner of the full value FRESCHETTA coupon and 2 sets of FRESCHETTA Proud to Support Pink ear buds is entry #92 MrsShukra! Congratulations!